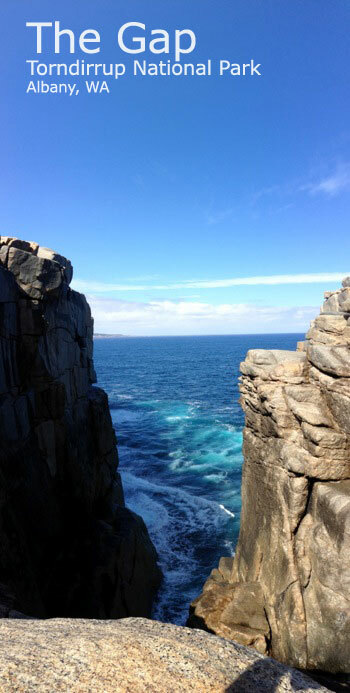 Torndirrup National Parks is definitely one of the most impressive and diverse national parks along the Rainbow Coast. From towering granite cliffs to white sandy beaches, amazing views and wonderful walks, Torndirrup National Park should be on your list while visiting the Rainbow Coast and Albany Australia. The Torndirrup Peninsula is known as Torgadirrup to the local Aboriginal community who are the traditional custodians of this country. Situated on the Torndirrup peninsula which shelters Albany from the Great Southern Ocean, Torndirrup National Park has some of the Rainbow Coast's most extraordinary natural features. The north side of the peninsula is the Princess Royal Harbour and to the east the King George Sound. The south side takes the full force of the Southern Ocean. Torndirrup National Park covers almost four thousand hectares and is home to the famous 'The Gap' and 'Natural Bridge' rock formations (below) as well as The Blowholes which have formed over thousands of years. These granite outcroppings have been slowly worn away by the Great Southern Ocean since it broke away from Antarctica when Australia was part of the supercontinent Gondwana. The rocks along this coastline are OLD, many of which were formed up to 1800 million years ago. Access Torndirrup National Park south of Albany along Frenchmans Bay Road. Along the way stop at the Albany Wind Farm which is on the peninsula but just north of the National Park. View the Torndirrup National Park Map to see the locations of the many attractions the park has to offer. From atop Stony Hill you can see most of the Torndirrup Peninsula as well as West Cape Howe, the southern-most point of WA, and the western-most point of the Great Australian Bight, across the bay. Cable Beach and the giant boulder placed by the sea, from the top of the stairs to the beach. The peninsula is known also for it's flora, fauna and ocean life. Incredible wildflowers can be viewed throughout the national park. Torndirrup's flowers are open between October and January. Whale watching is popular between May and October from the lookouts along the peninsula including the Albany Wind Farm Lookout, Frenchman Bay and Salmon Holes. Look for the spray, bring your binoculars. Wherever you go in the National Park you will find natural, rugged beauty and incredible vistas. Frenchman Bay, technically not part of the National Park, is at the end of the peninsula. Salmon Holes is a very popular fishing beach on the Torndirrup. 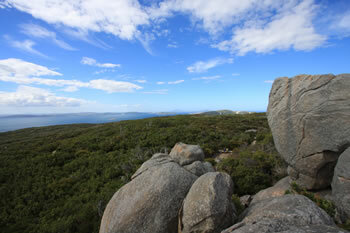 Albany is the nearest town located 15km to the north of Torndirrup via Frenchman Bay Road. The drive takes you around the western edge of Princess Royal Harbour and along the tree-lined peninsula towards all of the natural attractions of Torndirrup National Park. It is a beautiful and easy drive from Albany. Natural Bridge formation is located at The Gap, and a sealed walkway will take you directly to the Bridge. Sheltered on one side, looking back towards Albany and the Stirling Ranges far to the north. THE TORNDIRRUP PENINSULA CAN BE DANGEROUS: The ocean is unpredictable, sending surges even at calm times. BE AWARE when close to the water. Lives have been lost along the Torndirrup Peninsula. Read the information on SURGES and read and obey all signs while visiting the park. A visit to the Torndirrup peninsula is an ideal day trip from Albany, Australia.